Let's Stamp! : Let it Snow! Yes, I know that this post is rather unseasonal of me, but seeing as the north of England and Scotland had some snow last week, perhaps it's not that unseasonal! I suddenly realised that I'd not shared these photos with you, and seeing as this layout was done as a challenge from an American friend of mine, that was rather remiss of me (sorry Lindsay). The challenge was to use part of a Christmas card on our layout and to also include green. Now, I have to confess that I've not been terribly successful at including the green element of the challenge but there is green on the card so I hope that counts! 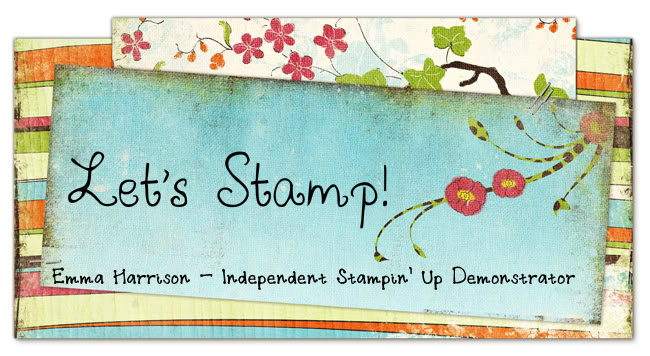 All the products are by Stampin' Up! I forget the exact name of the paper but it was one of the Christmas designs last year. I've also shimmer sprayed it slightly but you can't really tell in the photo. The cute snowflake was made using the 3-layer doily punch and I've also made a banner with the doily border punch. Both have been covered in dazzling diamonds of an added extra bit of bling! It's a nice and simple layout but I hope you like it all the same!